Enter the world of the Junkyard, where rival tribes fight an endless war-vying for supremacy and the right to ascend to Nirvana. Changed forever by a mysterious light, Serph and his comrades now have the power to change into powerful demons... but with that power comes a price - an insatiable hunger to devour their enemies! 29/05/2014 - Shin Megami Tensei: Digital Devil Saga coming to PSN next week! After a fairly lengthy (but worthwhile) wait, we are delighted to announce that the fantastic JRPG Digital Devil Saga will be coming to PSN in Europe next week on the 4th June, through the PS2 Classics programme. 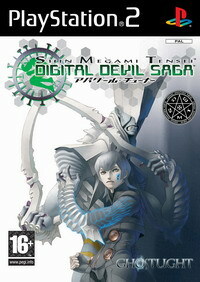 Digital Devil Saga will be priced at just £6.49 (€7.99). SMT, SHIN MEGAMI TENSEI™ and DIGITAL DEVIL SAGA™ are trademarks of Atlus USA. Licensed to and published by Ghostlight.